Keeping you on the go, all day long, Atom Milk Compression Socks are revolutionary support legwear for everyone (contraindications apply for certain conditions), as opposed to only those with circulation issues,. The Atom mission is to make you ‘want’ to wear compression hosiery rather than just ‘need’ to. 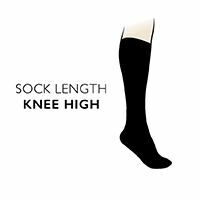 Routine daily wearing of these graduated compression socks helps prevent circulatory problems and promotes proper blood flow for energised legs. But that’s only a part of the story. Atom Milk Compression Socks use innovative, patent pending Lanati H1 fibre, a naturally-based fibre created from pure drinking milk protein that is soft, glossy and moisturising milk fibre fabric that is also sanitising and anti-microbial. A truly international effort, conceived in the UK, designed in the USA and made in Italy to the very highest standards, unlike most compression socks, Atom Milk Compression Socks are easy to pull on and off. They offer circulation-supporting graduated compression to 18-22mm Hg, British Standard Class II. Comfort is increased further by stay-put, non-restricting cuffs and hand linked toes for smooth seams, along with reinforced toes and heels.